Video game blog 1up (among others) noted that Bill Gates’ recent Consumer Electronics Show keynote included a demonstration of the very cool Microsoft Surface, a multi-touch display panel sorta like the one you saw in Minority Report. The funny part: we hear that Bill used the surface to customize a snowboard, commenting on how cool it was to apply the customizations with one’s hands. 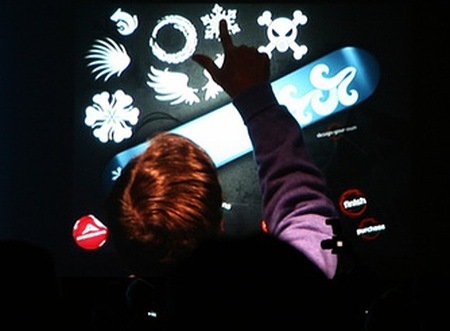 Incredibly, we’ve been doing things like customizing snowboards with our hands for quite some time. Now that you’re spending a little more time away from the office, Bill, why not take a stab at the old-fashioned way? If you’re stumped for projects, we’d be happy to recommend a few to get you started. Is it just me, or is it strange that the HF ad on toolmonger says “Summer Sale” in January? Having tried Surface, I can tell you it’s super cool. Better than the stuff Apple has on the iphone because it doens’t require touch. However, where do you see that in Minority Report? That was more like Vicon than Surface.